It’s finally here! Yay!I just got my author’s copies! 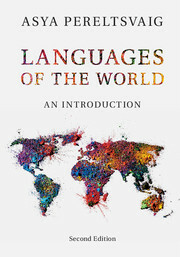 Languages of the World: Second Edition, published by Cambridge University Press is now available! Pereltsvaig, Asya (2017) On Slavic-influenced Syntactic Changes in Yiddish: A Parametric Account. In: Yohei Oseki, Mashe Esipova, Stephanie Harves (eds.) Annual Workshop on Formal Approaches to Slavic Linguistics. The NYU Meeting 2015. Ann Arbor, MI: Michigan Slavic Publications. Pp. 281-300. Slavic influence on the phonology, morphology, and lexicon of Yiddish is well-documented (Weinreich 1980, inter alia). In contrast, syntactic innovations triggered by contact with Slavic languages are rarely investigated. This paper examines the extension of verb-second (V2) from root clauses to embedded clauses, which was suggested to be Slavic-influenced by Weinreich (1958) and Santorini (1989, 1992). However, no satisfactory explanation has been offered in the previous literature for how Slavic languages—which lack V2 in either root or embedded clauses—could have engendered such a change in Yiddish. The key to the proposed analysis is treating (embedded) V2 not as a unitary phenomenon, but as a “constellation” of parameter values, some of which were already in place in Yiddish before Slavic languages came into the picture and the rest of which changed under the influence of Slavic. The Indo-European Controversy on sale at Amazon! You’ve wanted to read The Indo-European Controversy: Facts and Fallacies in Historical Linguistics for some time now but the book seems too expensive? Well, now’s your chance: Amazon sells it for only $25.50! That’s 75% discount from the original price. I don’t know how long the sale is going to last so get your copy today. In this course, we will examine the principles behind English grammar and will dispel many a mystery surrounding it. We will ask: Why is there “stupidity” but not “smartity”? Who decides what is a word anyway? How do we put words together into meaningful sentences? How do we interpret sentences to mean more than is being explicitly said? How do children acquire the knowledge of these grammatical intricacies? And how do adults learn them in a foreign language? By looking at these and similar issues, we will develop a subtler and more thoughtful approach to grammar. While the focus of this course is on English, we will also see that other languages possess grammars that are based on the same principles and constraints. So in addition to learning many fascinating (and glamorous!) things about our own language, we will gain new tools that will be helpful in learning another language—any language. English, like all other languages, changes over time and varies according to place and social setting. The way a person sounds—such as with the “southern drawl” or dropping their “r’s”—immediately conjures up a sense of the place where they come from. But the way we speak is influenced by many factors: not only our geographical roots, but also our social and educational background, our working environment, our friends, our own sense of identity, and even our political views all affect how we sound. In this one-day workshop, we will examine English dialects and accents around the country and around the world, and how they changed over time. We will wonder what Shakespeare really sounded like, and how we can know that. We will observe how English speakers can manipulate the way they speak to emphasize their identity. We will hear Bostonians and New Yorkers, posh and working-class Londoners, Scots and Irishmen, Canadians and Australians—and then come back to Northern California and look at its changing linguistic landscape. Students will develop a better appreciation of the variety of accents and dialects in English, the people who speak them, and how we react to people speaking in different ways. 100 years ago, in November 1917, the Bolsheviks led by Lenin took over the power in Russia in a largely bloodless coup; but the Russian revolution was more than just a change in who exercised political power. Followed by several years of civil war and foreign intervention, the revolution changed not only the political structure of the country, but its economy, its social fabric, and even the nature of the most personal relationships among its citizens. In this course, we will consider how the socialist revolution set Russia on the course for planned economy, repressive dictatorship, and imperial aggression. We will examine in what ways post-Soviet Russia continues with economic, political, and social models that were established by the Soviet regime. We will explore why the majority of Russians today admire Putin despite a growing economic crisis; why they are so intolerant of homosexuality; why Russian women hate feminism; and other similar issues that perplex a Western observer. By evaluating the balance sheets of the last century of Russian history, we will ponder the future of Russia and its role in international affairs. Looking forward to seeing you in one of those classes! Coming soon! LotW, 2nd Edition will be published on August 24! My book (Languages of the World: An Introduction, 2nd Edition) will publish on 24 August 2017 in the UK and Europe and soon thereafter around the world — yay! My article on the state-of-the-art in Esperanto linguistics has been published in Language Problems and Language Planning 41:2 (2017). Esperanto is an unusual language in many ways. First, it was originally created artificially, in a highly multilingual environment. Secondly, it was designed with the express purpose of becoming a language of interlingual communication, a language easy to learn for people from the widest range of linguistic backgrounds. Although it never became a universal lingua franca, Esperanto now has up to 2 million users and a sizeable number of native speakers. Yet even for such native speakers, Esperanto is never their only language. Its use is limited to certain domains, and for the overwhelming majority of its speakers, including native ones, Esperanto is not their dominant language. These facts may make Esperanto and Esperanto speakers useful in tests of the robustness of generalizations about linguistic typology, Universal Grammar, first and second language acquisition, language contact and creolization, variation and change. This article provides an overview of work that has been done to date on these topics. Advance Praise for Languages of the World is IN! You can pre-order your copy (available in September) from Cambridge University Press. In the meantime, next Saturday I am going to teach an all-day workshop on Languages of the World. You can still sign up here. The last film that we watched in my Russian film class was Andrey Zviagintsev’s Leviathan. In the introductory presentation to the film, I talked about the Biblical stories that are heavily referenced in the film: the story of the primordial evil sea monster Leviathan; the story of Job, whose faith is tested through a series of misfortunes; and the story of Naboth, whose vineyard was wanted, and ultimately expropriated, by the king. We also talked about Thomas Hobbes’ book of the same title. Since we didn’t have enough time after the film to discuss it, as we did with other films, I was asked by my students to write up some thoughts on visual elements and questions I wanted them to think about. So here it is. As with two other films we’ve seen, Cranes Are Flying and Autumn Marathon, Leviathan starts and ends with the same visual imagery: the view of the location of Kolya’s house, with the Barents Sea and the mountains at the background. The broad vistas and the accompanying music by the American composer Philip Glass help elevate the story of one “little man”, Kolya, to the level of an epic saga about individuals and the state, akin to Thomas Hobbes book. In this, the film follows in the footsteps of such greats of the Russian literature as Pushkin, Gogol, and Turgenev. In the opening scene we see Kolya’s house and the associated outbuildings taking a proud spot in the visual center of the film’s frames, just as it was the emotional focal point of Kolya’s life, his anchor in the rough seas of life. In the closing scene we see the same location, framed by the sea and the mountains, but now a newly built church takes up the exact spot where Kolya’s house used to be. No longer a man’s home, it is now a house of God. Or is it? The departure of the Church from its mission is further alluded to in a parallel between the plot and dialogue of the film and the Biblical story of Naboth. In the Bible, the king is so overtaken by his desire to have Naboth’s vineyard that he is unable to eat, sleep or enjoy life. His wife, Queen Jezebel urges him: “Are you king or aren’t you? Go and take it!” (In this, she reminds me of Lady Macbeth.) In the film, the role of “Queen Jezebel” is played by the bishop: he urges the corrupt mayor to wield power (and violence, if necessary) to enforce his desires by all means necessary. Worldly affairs, he says, are the domain of secular authorities, and it is up to the mayor to hold the reigns of power “on the territory entrusted to him”. Thus, the bishop gives the mayor the ultimate justification for his corrupt ways (“All power is from God”) and an absolution for all sins (perhaps even murder!). The earthly rulers and establishment of the Church are thus shown to have divided up the world but ruling their respective domains with equal cruelty and disregard for the bodies and souls of those ruled. (As I watched this film, I was struck by the cognate titles for the earthly and divine rulers: the mayor refers to himself as vlast’ “authority” and addresses the bishop as vladyka “your holiness”—in Russian, the two words share the same root. I’d never thought of that before.) The marriage of the earthly and divine rulers, their merger into a single terrifying whole, is further underscored by such minute details as the portrait of Putin in the mayor’s office and the bust of Jesus in the bishop’s office (which the camera focuses on): has Putin been deified through a “cult of personality”, not unlike that of Stalin? or has Jesus been reduced to an administrator deciding property disputes, punishing and promoting people in accordance to principles that are far removed from Biblical morality of “Thou shalt not…”? Putin’s portrait on the wall of the mayor’s office caught my attention for yet another reason as well: it is shown to hang directly above the mayor’s head, where it is not likely to be seen often by the mayor himself. It is placed there for the benefit of those who enter the office to plead their case with the mayor (like Kolya’s lawyer friend does) or to take orders (as the prosecutor and the mayor’s two underlings do). The vertical line formed by the portrait and the mayor’s own head underneath it is a great visual representation of the “power vertical”, a concept that is crucial to understanding the Russian “Leviathan” (in Thomas Hobbes’ sense, that is the state). The entire state apparatus is aligned vertically, with Putin as the culminating point on top (and before that, Soviet and post-Soviet rulers, and even earlier, the Tsars). There is no horizontal organization of “checks and balances”, alternative sources of power, a real separation of powers, a civil society, or (as we see in the film) the separation of church and state. This vertical structure prevents the Russian state from being, as Thomas Hobbes envisaged it, a necessary evil required to protect individuals from arbitrary cruelty of other individuals and to arbitrate conflicting interests of different individuals. Instead, the state itself is the evil that individuals need to be protected from, if only there was any entity, besides blind fate, that could protect them. Another episode with portraits, those of past rulers, emphasizes another characteristic feature of the Russian state throughout its history: every “change of the guard” is a mini-revolution. There is no clear set of rules on how one ruler, be it president, General Secretary, or Tsar, is to be replaced by the next one. Whatever rules are written down in the law can be set aside or manipulated by the rulers as they see fit. The same was true during the Soviet period, as can be seen by the changing titles of those who were the recognized rulers. (For example, Stalin was the formal head of state only from May 1941 to his death in March 1953; before that, he was “merely” the head of the Communist Party.) Even under the Tsars, the rules changed several times, nor did they lay out what is supposed to happen in all possible situations. (The uncertainty about the succession after Nicholas II’s eventual death is said to have contributed to the revolutionary events of 1917.) After a ruler is dead or replaced (with more or less violence), they are not seen as respected leaders who have done their best for the country, but as either a weak jester or an cruel strongman. In either case, it does not seem ridiculous to use a former ruler’s portrait as a target for shooting practice. One final note concerns the visual imagery that caught my eye in the context of another film we watched in this class. Towards the end of the film, when Kolya’s house is being destroyed by backhoes and excavators, it is cleverly shown from within the house, which makes it look to the viewer as if one’s own house is being destroyed. The image of a former home, part of whose external structure has been broken down, reminded me of the scene from Cranes Are Flying, where Veronica runs up the steps of their building to find their apartment (and her parents in it!) gone forever. In both films, the partial destruction powerfully underscores that what used to be “home and hearth” is no more. But in Cranes Are Flying, it is an external entity, an enemy state (Nazi Germany) that causes the destruction with such impersonal means as bombs and artillery shells shot from afar. In Leviathan, it is not some foreign enemy but the Russian state itself that destroys all that was near and dear to Kolya and his family, by using far more personal and close-up machinery for the destruction. (The family too is ultimately destroyed, through the betrayal of Kolya’s wife and the adoption of his son, once Kolya himself is sent to prison.) I don’t know whether this allusion to a scene in an earlier film was Zviagintsev’s intention, a subconscious reference to a film that he doubtlessly had seen, or a pure accident—but in either case, to me this parallel poses a question of whether today’s Putin-ruled “Leviathan” of a country is what “our grandfathers have fought for”. After hearing positive recommendations from several friends, I finally picked up Yuval Noah Harari’s Sapiens. A Brief History of Humankind, and I have to admit that I am somewhat disappointed. I can see why it’s such a popular book: it’s certainly written in a clear, vivid language and brings complex ideas to a layman level. In short, he’s doing a great job in terms of popularizing science. It’s the “science” that he’s popularizing that I find somewhat disappointing, especially when it comes to language. Yet the truly unique feature of our language is not its ability to transmit information about men and lions. Rather, it’s the ability to transmit information about things that do not exist at all. When researchers played a recording of the first call to a group of monkeys, the monkeys stopped what they were doing and looked upwards in fear. When the same group heard a recording of a second call, the lion warning, they quickly scrambled up a tree. Such animal calls do not impart information in the sense of truth/falsehood, like Sapiens sentences. A monkey cannot say “that’s not true!”. Sapiens language on occasion uses similarly instructive rather than informative signals, such as “Fire!”. However, the bulk of what we use language for is to transmit information, not to urge our listeners to do this or that action, at least not directly. This is discussed in great detail in Derek Bickerton’s Adam’s Tongue. How Humans Made Language, How Language Made Humans, and I’ll refer the reader to Bickerton’s excellent discussion. In fact, on p. 37 Harari sums up the new Sapiens “Language” ability in three bullet points that all start with “the ability to transmit (larger quantities of) information about…”. That, in and of itself, is the core new ability that “happened in the Cognitive Revolution”: transmitting information. Going back to the date when the Cognitive Revolution happened, it is not clear to me what evidence there is that it happened 130,000 years after the emergence of the Homo Sapiens species. Existing genetic evidence suggests that (to the extent that it can be taken as evidence of language at all) the genetic basis for Sapiens language, the H. Sapiens version of the FOXP2 gene, emerged ca. 200,000 years ago. Some scholars have argued that not only did we Sapiens have the genetic underpinning for developing Sapiens language but that Sapiens language allowed us to out-compete other (human and non-human) species despite our lightly built skeleton and overall fragile physique. Harari himself suggests that our ability to use “fictive language” and to cooperate in language groups as a result of our linguistic capacity is what allowed us to out-compete (and ultimately push out of existence) our Neanderthal cousins: “In a one-on-one brawl, a Neanderthal would probably have beaten a Sapiens” (p. 34). How, then, did Sapiens survive language-less for 130,000 years with the same anatomy as their linguistically-endowed descendants in the last 70,000 years ago? And if they had some other evolutionary advantage that allowed them to survive alongside the Neanderthals and other ancient human species, as well as lions, hyenas, gorillas and other competitors, what could have been the impetus for the emergence of language ca. 70,000 years ago? Harari, disappointingly, leaves the whole issue of how Sapiens language emerged open, but it is clear that by his logic it must have been a biological event, one driven by “genes, hormones and organisms” (p. 38). Only the emergence of Sapiens language allowed us to the “bec[o]me exempt from biological laws”. If that’s the case, the emergence of Sapiens language should be correlated with some biological event, such as a mutation in a gene that produced our linguistic ability, whether directly or indirectly. This brings us back to the FOXP2 and its presumed emergence ca. 200,000 years ago, in contradiction to what Harari states. And that brings us, inevitably, to the question of Neanderthals and their linguistic abilities, an issue that remains rather murky, to say the least. Harari assumes that the Neanderthals had some language (recall that he doesn’t reserve the term for the unique Sapiens ability). They “could share information about the whereabouts of lions, but they probably could not tell — and revise — stories about tribal spirits” (p. 34). In other words, they did not have Sapiens language but they had the ability to transmit information about “real world entities”. Whether such an intermediate stage (i.e. predicative language without “fictive” entities) ever existed, what may have prompted its emergence or its transformation into a fully Sapiens “fictive” language is not at all clear. Which is not to say that it is impossible for such intermediate stage to have existed in our Homo cousins, but at the moment such a possibility remains rather “fictive” (in Harari’s own sense). It appears that the Neanderthals had the genetic basis for Sapiens language (if so, it would need to be renamed “Homo language”); see Krause et al. (2007). Yet, these findings are open to various interpretations. Harari could be right if FOXP2 could be shown to be responsible for predicative but not necessarily “fictive” language, yet I am inclined to agree with Bickerton that predicative language (i.e. language that can be used to transmit information) is impossible without the type of signs that refer to classes/kinds, ergo to abstract entities. Klein, R.G. and Edgar, B. (2002) The Dawn of Human Culture, Wiley, New York. This past weekend I’ve been reading an excellent book by David Satter, The Less You Know, the Better You Sleep, a real page-turner which reads as a mix of investigative journalism and a whodunit (buy it on Amazon). Satter sheds a compelling light on disturbing yet persuasive evidence that Putin’s “dunit”: he and his circle are implicated in a series of crimes, including the bombing of apartment buildings in Moscow, Buinaksk, and Volgodonsk in 1999, the Nord-Ost theater siege in 2002, the Beslan school siege in 2004, and murders of ex-KGB officer Alexander Litvinenko, journalist Anna Politkovskaya, opposition leader Boris Nemtsov and scores of others who challenged Putin’s regime. (Satter himself, it must be added, has been expelled from Russia due to his investigative activities and writings.) In the conclusion (p. 172), Satter notes that although the evidence is circumstantial, its totality “presents a picture of guilt so convincing that were it presented against an individual in a criminal case, the verdict would be obvious and incontrovertible”. The only reason why “the Putin regime never faced a court of law [is] because it controlled the judicial process and was in a position to seize and then hide or destroy the evidence”. It is, therefore, a cautionary tale (as if the world needed another one!) about the dangers of an autocratic dictatorship and a “power vertical”. Understanding Russia is actually very easy, but one must teach oneself to do something that is very hard—to believe the unbelievable. Westerners become confused because they approach Russia with a Western frame of reference, not realizing that Russia is a universe based on a completely different set of values. If a Westerner takes it for granted that the individual has inherent worth and is not just raw material for the deluded schemes of corrupt political leaders, he may not realize that in Russia this outlook is not widely shared. To grasp the reality of Russia, it is necessary to accept that Russian leaders really are capable of blowing up hundreds of their own people to preserve their hold on power. They really are capable of ordering an attack with flamethrowers on a gymnasium full of defenseless parents and children. Once one accepts that the impossible is really possible, the degradation of the Yeltsin years and Vladimir Putin’s rise of power make perfect sense. Tomorrow, my Russian film class is watching Andrey Zviagintsev’s Leviathan, an equally disturbing view of what the regime that’s capable of waging war on its own people looks like from the perspective of those people.